The dramatic rescue of a cat from a sewage drain in Chelmsford at Christmas last year is due to feature on a TV show. The family of two-year-old Marmaduke were extremely worried about their tabby cat last Christmas, as she was trapped down a storm drain in Rennoldson Green. Her owner phoned the RSPCA after she saw Marmaduke’s little head pop out of the pipe and disappear again. Animal Collection Officer (ACO) Donna Smith attended on Christmas Eve to lift the drain cover and put blankets down to cushion the cat if she decided to jump out. She put some smelly tuna at the entrance and hoped this would coax the intrepid moggy out. Sadly as most people woke to open their presents with excitement on Christmas morning, poor Marmaduke was still stuck in the drain and her family were very worried. RSPCA Inspector Marie Hammerton was called in to help but she was unable to see or hear the cat. She contacted Essex Fire and Rescue Services who requested help from the Urban Search and Rescue team. 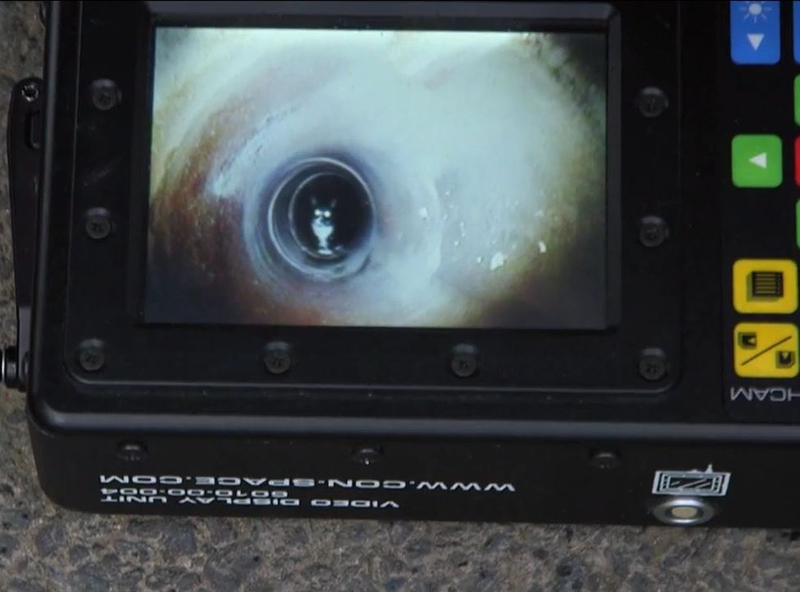 They then used their camera mounted to a long pole to be able to see inside the drain. Inspector Hammerton said: “When they put the camera down the drain which the owner thought the cat was down, it was discovered that there was a drop in the drain and the cat had dropped down there and so she was unable to get back out. “We decided to put a camera down the sewage drain although none of us believed that it was actually linked to the part where Marmaduke was but this was a last ditch attempt. At this point we were really worrying that we would have to seriously consider the possibility that we would have to walk away as we just couldn’t reach her. Then on the camera we saw two flashes which looked like cat eyes! Inspector Hammerton was incredibly relieved to have Marmaduke in one piece, as was her family. The inspector took the cat inside her home and checked her over. She was a little dehydrated but otherwise appeared in good health. Inspector Hammerton added: “I gave her owner some advice on any signs to watch out for as she had been down a sewage drain. They left her to chill for the rest of the day and went out to see family and cleaned her off upon returning home once she had chilled out. “Marmaduke’s owner was a lot more grateful than Marmaduke. She gave me a huge hug as a thank you. I was two hours late home but I didn’t care. It was definitely worth it, especially considering the owners had been through a range of emotions that day, including the fear that we may have had to walk away. Now rescued Marmaduke is due to star on the small screen in the Channel 5 show Jo Brand’s Cats and Kittens.